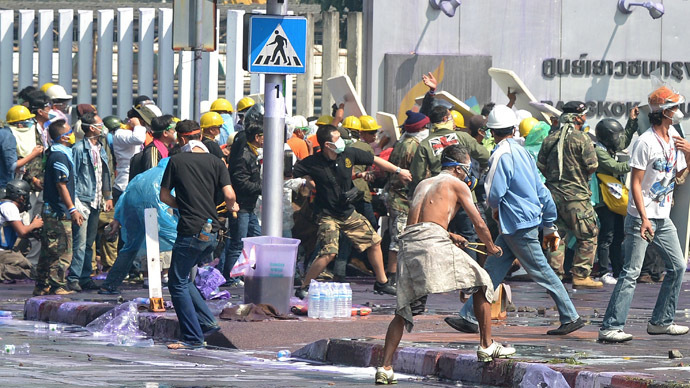 Two blasts at an anti-government rally in Bangkok have left at least 28 protesters injured, some seriously. As the protests go on despite previous assaults, Thailand's army chief is urging the government and opposition to negotiate. The first explosion near Victory Monument, in the north of the city, where protesters continue to rally ceaselessly, went off some 200 meters from a stage set up by opposition activists. Police believe the explosion was caused by frag grenades. 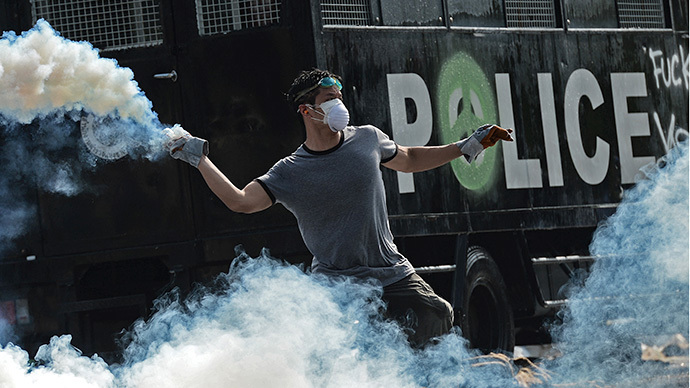 The 28 injured protesters were brought to four different hospitals in the city, according to the Bangkok Emergency Medical Center. Seven are in critical condition. Another blast happened minutes later near vendors selling anti-government T-shirts, reportedly injuring two of them. "The first blast I heard was from behind the stage," Reuters reported Teerawut Utakaprechanun as saying. "People were looking around. I saw the security guards running after a suspect. After one minute I heard another bomb blast." 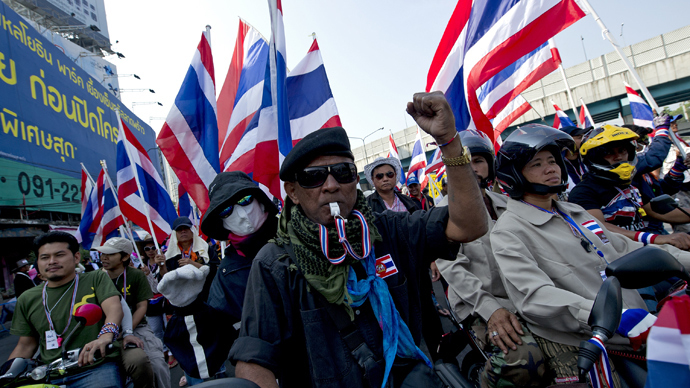 Protesters who run several round-the-clock demonstrations in Bangkok since November 2013 are being increasingly targeted by unknown malefactors. 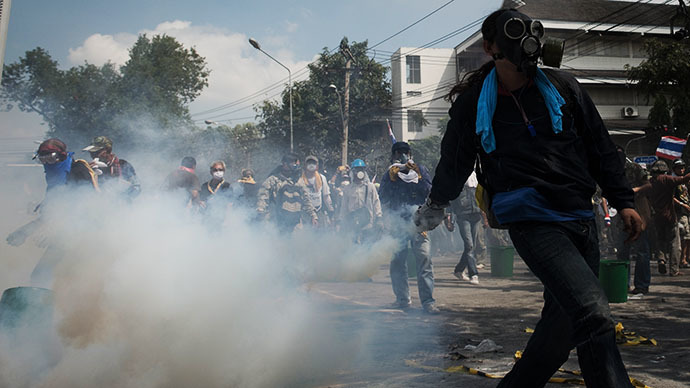 On Friday a frag grenade thrown into group of marching opposition activists killed one and wounded at least 35 demonstrators. On Saturday night, shooting took place some 300 meters from a stage used by protesters. A 54-year-old volunteer guard was seriously wounded in the back and remains in intensive care after undergoing surgery. Also, police reported that small quantities of explosives were thrown at protest leaders’ homes. 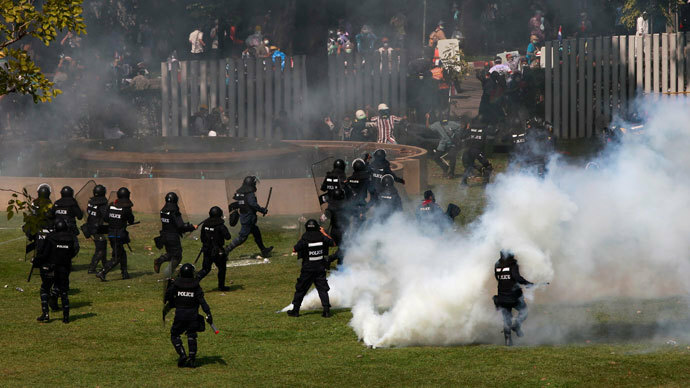 Since November, the death toll of both protesters and police has reached nine. 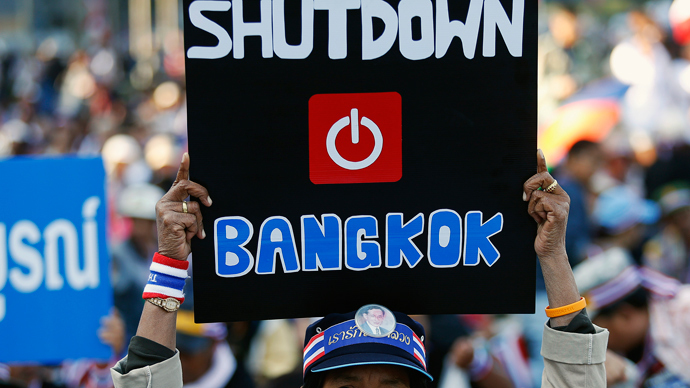 Tensions are rising in the 12-million Thai capital ahead of the elections called to quell the latest political crisis, which started in November. 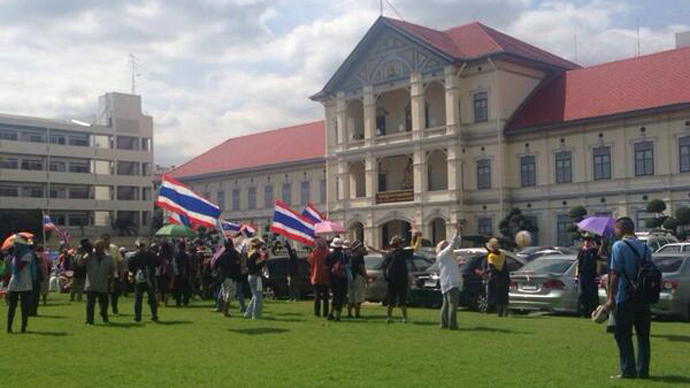 The anti-government protesters are demanding that Prime Minister Yingluck Shinawatra and her government quit. Yet unlike similar protests in 2010, the pro-government ‘red-shirt’ demonstrators so far have not appeared on the streets of Bangkok, which definitely helps to prevent otherwise inevitable factional clashes. But this could change. After PM Shinawatra assigned early elections on February 2, demonstrators’ major aim is to disrupt the elections, since the results of a national poll might not be in favor of the opposition. The main opposition Democrat Party has already announced it is going to boycott the elections. 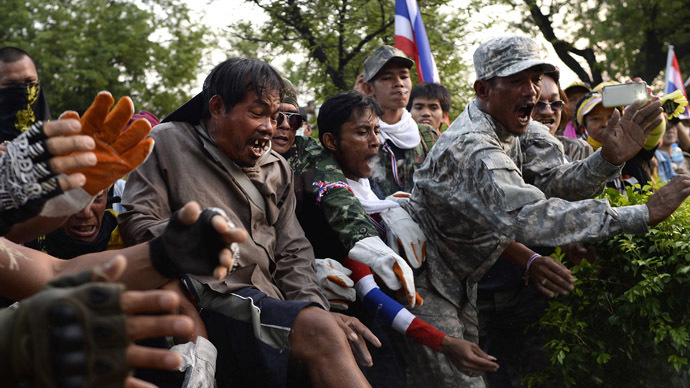 As the date of the elections gets closer, the violence is intensifying, which raises suspicions that the Thai army might step in to put the unrest to an end. The Thai Army has staged 16 successful coups (and two failed ones) since the Thai monarchy ceased to be an absolute monarchy in 1932. The latest coup in 2006 deposed the then-PM Thaksin Shinawatra, elder brother of the current Prime Minister Yingluck Shinawatra. After the coup, Thaksin had to leave the country for “voluntary” exile and is still unable to return, even with his sister being a PM. Yet as of today the army seems to be reluctant to interfere. “The relationship between the government and the army is normal,” Thai top commander Thanasak Patimapakorn declared on Saturday after the country’s Army Day parade. He stressed that all sides must respect the law. “I request that all sides should come together and talk to find a solution,” Thanasak said. In an interview with the daily paper Bangkok Post, Thanasak said he had no interest in becoming prime minister or acting as mediator. Since 2001 poor rural population of Thailand has been supporting Shinawatra clan, ensuring victory in every election. 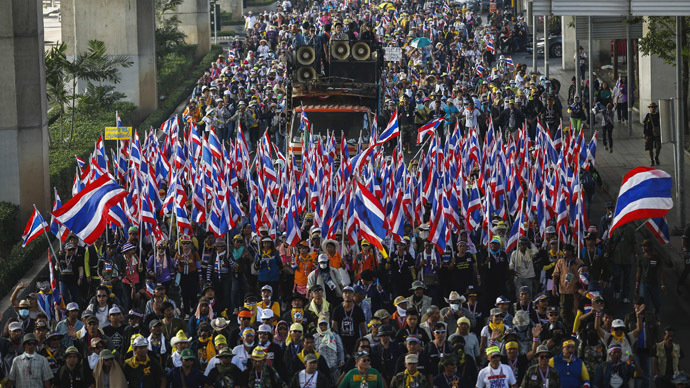 In contrast with rural Thailand, the urban population backed by country’s royalist elites and army, usually votes against “tribunes of the people,” which the opposition accuses of corruption and being a threat to democracy and power structures.